USAID is observing World AIDS Day this year by celebrating ten years of ourHIV and AIDS work under PEPFAR. 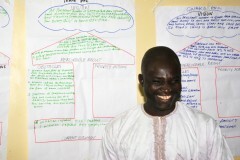 Over the past year, the Leadership, Management and Governance (LMG) Project helped support the PLAN-Health Nigeria project, funded by PEPFAR through USAID and managed by Management Sciences for Health (MSH), to pilot Leadership Development Program Plus (LDP+), which focuses on empowering teams to improve PMTCT results. The program also emphasizes new approaches tied in to country ownership, national health priorities, and specific health indicators. LDP+ was piloted in the town of Gwagwalada, Nigeria. The Gwagwalada Council is one of the five Local Government Area Councils of the Federal Capital Territory (FCT) of Nigeria. 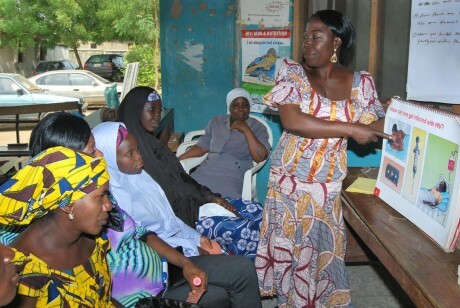 LMG and PLAN-Health worked with the Gwagwalada Council, which selected 20 participants—two from each of the 10 facilities providing PMTCT services in the area—to form 10 teams to participate in the LDP+. Together, the teams decided to address PMTCT and focused on improving some standard indicators such as number of new antenatal care (ANC) clients; number of pregnant women tested for HIV, counseled and received their results; and the number of HIV-positive women. The program ran from October 2012 to May 2013. During this time, the teams worked within their facilities to create a vision of improved results around PMTCT, align stakeholders around this vision, implement their action plans, and share learning with other teams to identify the most useful local interventions and activities. The teams also received coaching in the areas of monitoring, evaluation, and reporting. Most of the facilities reported encouraging results for their key indicators after participating in LDP+. For example, the Old Kutunku Health Center reported an increase from 17 to 61 new ANC clients per month. At the Gwako health center, the percentage of ANC clients who delivered in a health facility increased from 18 to 42 percent. Prior to LDP+, the Township clinic counseled and tested the partners of only three percent of pregnant women, compared with 20 percent after the program. The Gwagwalada Council’s oversight committee plans to continue the program with its own resources, expanding it to another eight facilities in the area. Through these efforts, this local government agency is furthering Nigeria’s national efforts to ultimately eliminate mother-to-child transmission of HIV. Follow @USAIDGH on Twitter through World AIDS Day, observed on December 2, for key facts, resources, and photos from our programs and partners and join the conversation using the hashtag #WAD2013.